Platform for Sharing AR Apps Hello Everyone...Happy Wednesday, new here and looking forward to incorporating Unity in my design work. Can someone please tell me if there's currently a platform with photo recognition where others can access my AR apps from their smartphone? Any input is greatly appreciated, thank you! How can I position a hologram in real world coordinates? Hi everyone. Someone knows if there's any way to position a hologram car, in the middle of the park next to my house? it's an idea similar to Pokemon Go, but simpler because I just want to put ONE car alone, on this site by GEOLOCATION. The park is a big square with grass, it doesn't have any visual information to use ARKit or ARCore, so I think the best option is geolocation. I'm having an issue in my builds that is making them completely useless. I've searched everywhere and I can't seem to find any information on it. It makes it so the HMD displays nothing and the camera just stays at it's start position. I'm using Unity 5.5.0p3 by the way, any help would be appreciated. [Solved]TriLib on Hololens, folder access I'm trying to use https://assetstore.unity.com/packages/tools/modeling/trilib-model-loader-package-91777 to load models at runtime. The idea is to have a json file containing the file names and additional info and the models as fbx. Replace original OpenVR SDK with its modified version Hi everyone! I had added some functionality into OpenVR SDK source code and built my version of openvr_api.dll. Now I wish to run my Unity project via this OpenVR dll, but I've stuck on thought where to place that dll? - Unity\Editor\Data\UnityExtensions\Unity\VR\ directory: failed, it seems that Unity just ignores my dll there. SteamVR Input Bindings not recognizing Oculus Touch Controllers I'm trying to setup my touch controllers with SteamVR and bind some actions so that I can pick things up with them. When I use the SteamVR Prefab I am able to see the controllers, and the SteamVR Overlay also shows both of my touch controllers. 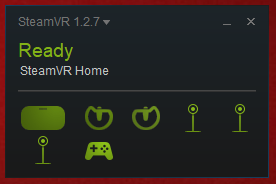 However when I go into the SteamVR Binding Menu I do not see my touch controllers showing up. Does anyone know why this might be? Let users create their own virtual tours Hey, I'm pretty new to Unity and I'm working on Virtual Tour using Oculus SDK. I want to create an application that allows users to view any virtual tour. UnityEngine.XR.ARBackgroundRenderer don’t render texture image from ARCore CameraImage. I develop Android application with ARCore. I got the Texture2D from camera by using TextureReader.cs in the ComputerVision example. Then, I try to render the texture to background with UnityEngine.XR.ARBackgroundRenderer, but couldn't. I use Unity2018.3.2f1 & ARCore1.6.0 & Huawei P20 for the smartphone. I have no error, but black screen. VR as career choice Hello! I’m a front end developer and I’m really interested in VR development with Unity. My question is do I have to switch fields or can both be done together?